Hot on the heals of Thursday’s Special Consensus gig in Dún Laoghaire, this weekend saw us cooped up in a castle in Co. Clare for some more winter bluegrass (& a whole lot more besides). Although this year alone there were 17 different performance venues shared between the towns of Bunratty and neighbouring Sixmilebridge, it’s the ye olde setting of Bunratty Castle & Folk Park in particular that provides a rather unique backdrop for the annual Shannonside Winter Music Festival. 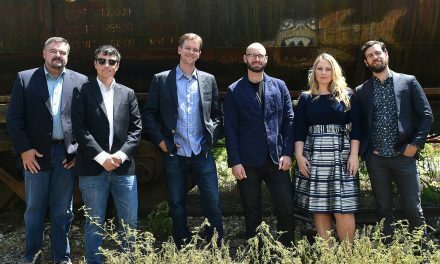 This 2019 iteration of the celebration of music that is the festival, the twentieth since its inception in 1999, had 80 events spread over 5 days covering 10 different musical genres, everything from classical to jazz to trad. 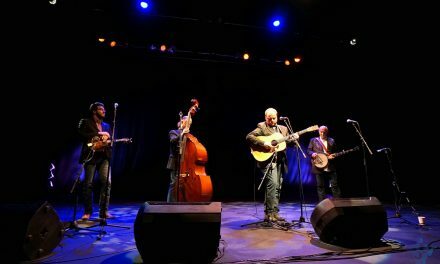 As always they do, John Nynan & Brendan Walsh saw to it that our beloved bluegrass was well catered for on the lineup, the Special Consensus, no strangers to the festival, the headline act. But until they rode into town for the established Sunday afternoon bluegrass concert, The Petersens & the Munich String Band ably held the keep, if you’ll pardon the oh-so obvious pun. 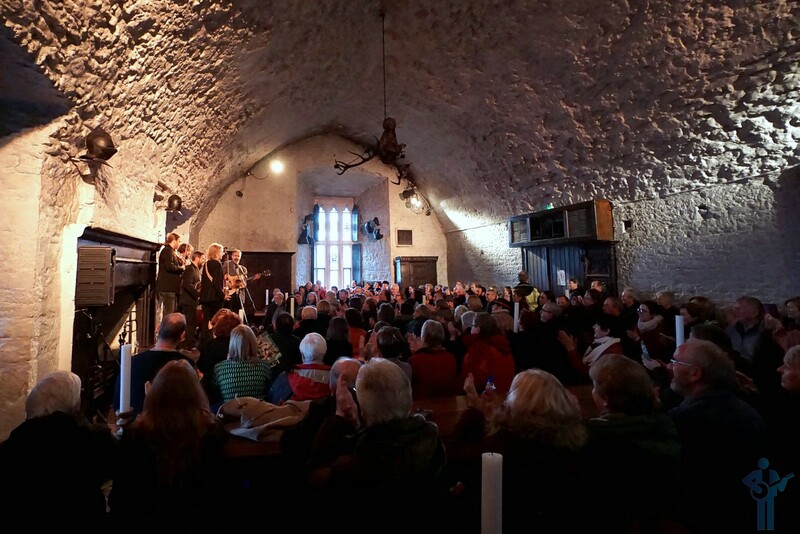 The Munich String Band (yes, they are Munich-based) performing in vaulted Main Guard hall of the mid-15th century Bunratty Castle, the former stronghold of the kings & earls of North Munster, during the 2019 Shannonside Winter Music Festival. January 19, 2019. Rhythmic mandolin, lashing guitar, grooving bass, then a fiddle sets in & the banjo rolls. And above all of that, five voices rise to harmony singing: This is bluegrass, as you’ve never heard it. A sound that never loses its raw energy with eclectic influences, but always with a bang in the classic formula. The impressive Bunratty Castle is the obvious towering centerpiece of the wider Folk Park, a living & faithful reconstruction of the environment of the Ireland of a century-plus ago (we’ll have to take the park’s word for that). 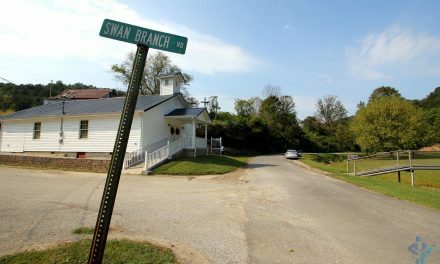 Rural dwellings, churches, gardens, workshops, mills, and even a complete village street accurately recreate a bygone era. It was in one of the park’s larger spaces, the Corn Barn, were there was standing room only for the first performance of the day from the talented & accomplished Missouri-based Petersens, purveyors of some mighty fine sibling bluegrass. 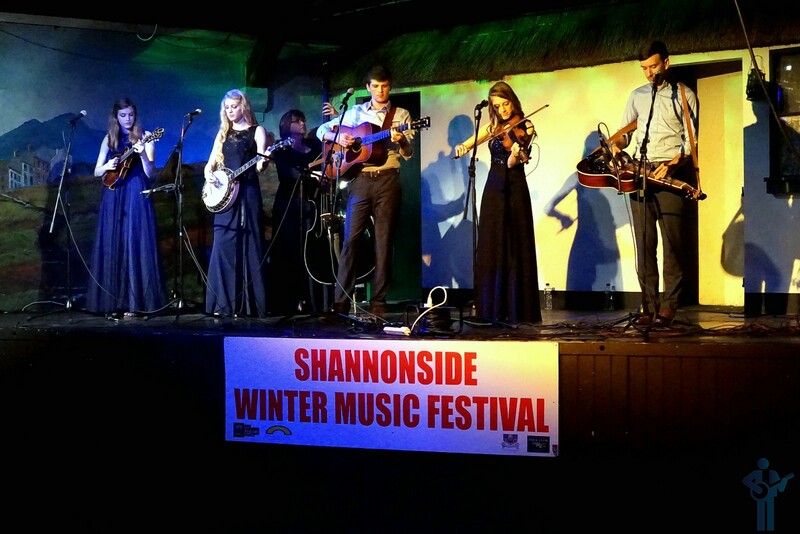 The Petersens – l-r: Julianne (mandolin), Ellen (banjo), Karen (bass), Matt (guitar), Katie (fiddle) & Emmet Franz (dobro) – performing in The Corn Barn of Bunratty Castle & Folk Park as part of the 20th Anniversary Shannonside Winter Music Festival 2019. January 19, 2019. Their playing and harmonies make the sweetest gospel country sounds this side of anywhere! 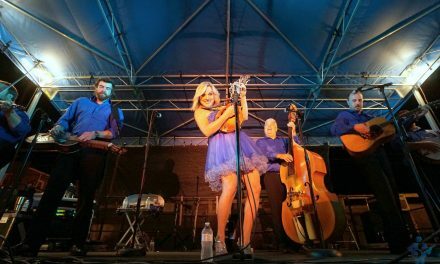 The Petersens are on their third tour of Ireland and will play various dates in the south until January 27. The complete schedule can be found on their website here. Presented by Sixmilebridge Folk Club, the Shannonside Winter Music Festival runs every January with performances split between various venues in the Co. Clare towns of Sixmilebridge & Bunratty. You can visit the festivals website here and its Facebook page here.